New CD Released – March 29, 2010! Songs of worship to the glory of God, for the blessing of people, and for our joy! 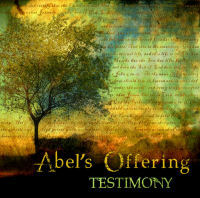 After four years and travels to four continents, including the Holy Land, East Asia and Eastern Africa, Abel’s Offering is proud to announce the release of their second CD project, “Testimony”, available now! Inspired by the faithfulness which God has displayed in the lives of the Band, songwriters Dan Chookaszian and Ben Snyder weave a tapestry of melody and rhythm around Scripture-inspired lyrics stretching from the prayerful to the most boisterous of praise. These songs echo the cry of our heart – we long to see Jesus Christ honored and glorified through our worship. Join us on this journey in praising our God as you listen to our… Testimony.